JNN 04 Aug 2014 New York : An Israeli News Paper has removed an article from its website, which urged “Genocide” in the besieged Gaza Strip, a report says. 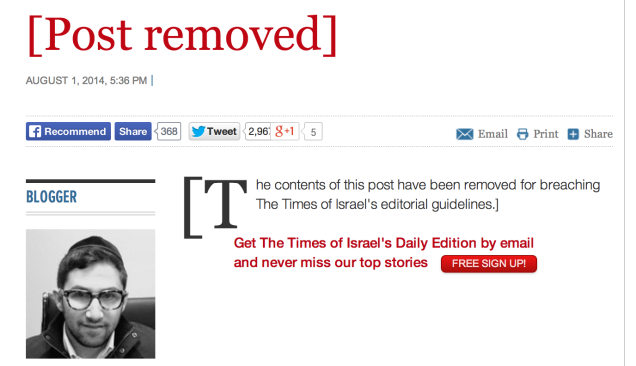 The article titled “When Genocide Is Permissible” was published by The Times of Israel on Friday, but was removed hours later, the Moon of Alabama website reported. 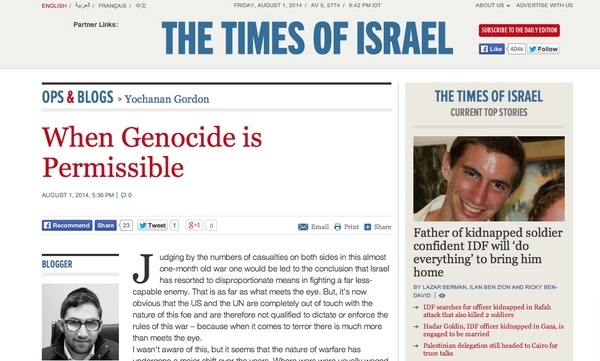 Written by Yochanan Gordon, who defended the move on hisTwitter page, the article called for committing genocide against the Palestinian civilians in Gaza who have been under a massive Israeli assault in the last 25 days. Israel’s “hands are being tied by world leaders who over the past six years have insisted they are such good friends with” the regime, Gordon claimed, adding that “nothing, then, can be considered disproportionate” in fight against Gazans. The call for Palestinian Genocide comes as US Secretary of State John Kerry condemned the Palestinian resistance movement Hamas on Friday for “capturing an Israeli soldier” and urged the group to release him. “Hamas, which has security control over the Gaza Strip, must immediately and unconditionally release the missing Israeli soldier, and I call on those with influence over Hamas to reinforce this message,” Kerry said. This is while Hamas says it has no information regarding the missing Israeli soldier, named as Second Lieutenant Hadar Goldin. Israel has been pounding the Gaza Strip since July 8. The air, sea and land strikes by Israel have so far killed more than 1,600 people and injured nearly 9,000 of others in the coastal sliver. The Ezzedine al-Qassam Brigades, the military wing of Hamas, has been launching retaliatory attacks against Israel. The Israeli military says it has lost more than 60 of its troops in clashes with Palestinian resistance fighters during the 25 days of fighting, but Hamas puts the number at over 145. This entry was posted in Middle East and tagged Gaza Strip, israel, The Times of Israel, Times of Israel, When Genocide is Permissible, Yochanan Gordon, Zionist Terrorism. Bookmark the permalink.